This book really matters…it is a manifesto to transform the way we understand, recognize, and respect the reality of our diverse and complex family compositions. Polikoff mobilizes an impressive array of legal history and contemporary court cases…She argues vigorously that our society needs to find new ways of determining when legally enforceable responsibilities and entitlements have accrued in interpersonal relationships. 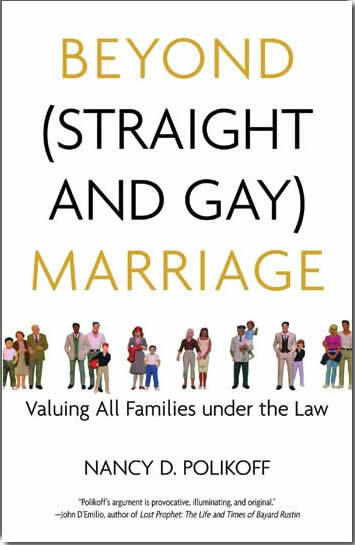 Passionate but completely grounded in reality, Polikoff challenges LGBT rights advocates to see beyond gay equality arguments and question the fundamental fairness of limiting family recognition based on marriage, gay or straight. It is a powerful call for social justice.